Trying to figure out how to make several Nintendo Gameboys communicate with each other in your game? Use this handy piece of commercial grade source code written in assembly to handle it all for you. This is a fully functioning example of two Gameboys communicating with each other over the serial cable. The source code was originally written for a Gameboy title that was never published and rather than let the source code remain unused I thought that other people might benefit from it. The .ZIP archive contains all the source code you need to be able to integrate multi-player in to your games. I do not offer any kind of technical support with this software so please do not ask. You should be aware that this software is copyrighted and the source code does belong to me but I am granting you a license to use it for free, in a commercial or non-commercial product. If you distribute the .ZIP archive on your web site, or give a copy to someone else, please leave the license.txt file intact. Even if you, or they, do not read the license.txt file you and the other person are still bound by it if either of you use this software. This is a legally binding document, so read it! IMPORTANT NOTICE — READ CAREFULLY: This Otaku No Zoku Customer License and Evaluation Agreement (“LICENSE”) is the agreement which governs use of the source code downloadable herefrom, including computer software and associated printed materials (“SOFTWARE”). By downloading, installing, copying, or otherwise using the SOFTWARE, you agree to be bound by the terms of this LICENSE. If you do not agree to the terms of this LICENSE, do not download the software. Use of Otaku No Zoku’s products and source code is protected. The SOFTWARE is protected by copyright laws and international copyright treaties, as well as other intellectual property laws and treaties. The SOFTWARE is not sold, and instead is merely licensed for use, strictly in accordance with this document. This agreement sets forth the terms and conditions of the SOFTWARE license only. 1.1 Customer. Customer means the business entity or individual that downloads the SOFTWARE. 2.1.1 Rights. Customer may install and use as many copies of the SOFTWARE on a single computer, and may make multiple back-up copies of the Software. This LICENSE of SOFTWARE may be shared or used concurrently on different computers. 2.1.2 Product. Customer may incorporate Software in to a commercial or non-commercial Product as long as such Product contains an acknowledgement to either “Otaku” or “Otaku No Zoku” that is visible on the game introduction or a game end credits. Customer may not incorporate this Software as part of an API or library. 2.1.3 Distribution. Customer may distribute the Software in source code form as long as the .ZIP archive remains intact, no fee is charged for distribution, and this license and all copyright notices remain intact and unaltered. Customer may distribute the Software in final object form as part of another product without the accompanying license. Customer may not distribute the Software in an intermediate form or as part of an API or library. 2.1.4 Restricted Entities. No current employee or company, that is carrying out work under contract, for hire, or for sale, to any of the following companies may make use of this software, in whole, or in part, for any purpose. The companies so listed; Lucky Chicken Games, Interplay, 3DO, Activision, Slitherine Software, Eidos. 2.1.5 Limitations. No Separation of Components. The SOFTWARE is licensed as a single product. 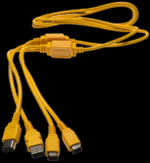 Its component parts may not be separated for use on more than one computer, nor otherwise used separately from the other parts. No Rental. Customer may not rent or lease the SOFTWARE to someone else. No Sale. Customer may not sell for profit the SOFTWARE to someone else. This LICENSE will automatically terminate if Customer fails to comply with any of the terms and conditions of it. In such event, Customer must destroy all copies of the SOFTWARE and all of its component parts. All title and copyrights in and to the SOFTWARE (including but not limited to all images, photographs, animations, video, audio, music, text, and other matters incorporated into the SOFTWARE), the accompanying printed materials, and any copies of the SOFTWARE, are owned by Otaku No Zoku, or its suppliers. The SOFTWARE is protected by copyright laws and international treaty provisions. Accordingly, Customer is required to treat the SOFTWARE like any other copyrighted material except that it may make multiple copies of the SOFTWARE for backup or archive purposes. This agreement shall be deemed to have been made in, and shall be construed pursuant to, the laws of the State of California. 6. DISCLAIMER OF WARRANTIES AND LIMITATION ON LIABILITY. 6.1 No Warranties. TO THE MAXIMUM EXTENT PERMITTED BY APPLICABLE LAW, THE SOFTWARE IS PROVIDED “AS IS” AND OTAKU NO ZOKU AND ITS SUPPLIERS DISCLAIM ALL WARRANTIES, EITHER EXPRESS OR IMPLIED, INCLUDING, BUT NOT LIMITED TO, IMPLIED WARRANTIES OF MERCHANTABILITY AND FITNESS FOR A PARTICULAR PURPOSE. 6.2 No Liability for Consequential Damages. TO THE MAXIMUM EXTENT PERMITTED BY APPLICABLE LAW, IN NO EVENT SHALL OTAKU NO ZOKU OR ITS SUPPLIERS BE LIABLE FOR ANY SPECIAL, INCIDENTAL, INDIRECT, OR CONSEQUENTIAL DAMAGES WHATSOEVER (INCLUDING, WITHOUT LIMITATION, DAMAGES FOR LOSS OF BUSINESS PROFITS, BUSINESS INTERRUPTION, LOSS OF BUSINESS INFORMATION, OR ANY OTHER PECUNIARY LOSS) ARISING OUT OF THE USE OF OR INABILITY TO USE THE SOFTWARE, EVEN IF OTAKU NO ZOKU HAS BEEN ADVISED OF THE POSSIBILITY OF SUCH DAMAGES. 7. MISCELLANEOUS. The United Nations Convention on Contracts for the International Sale of Goods is specifically disclaimed. If any provision of this LICENSE is inconsistent with, or cannot be fully enforced under, the law, such provision will be construed as limited to the extent necessary to be consistent with and fully enforceable under the law. This Agreement is the final, complete and exclusive agreement between the parties relating to the subject matter hereof, and supersedes all prior or contemporaneous understandings and agreements relating to such subject matter, whether oral or written. Customer agrees that it will not ship, transfer or export the SOFTWARE into any country, or use the SOFTWARE in any manner, prohibited by the United States Export Administration Act or any other export laws, restrictions or regulations. This LICENSE may only be modified in writing signed by an authorized officer of OTAKU NO ZOKU. If you do not agree to the license, leave this page.